Chaga is a medicinal fungus that grows on the birch trees in Siberia and Canada. It has been used in Folk Medicine for centuries to deal with various illnesses from digestive health to skin care. However, it is best known for its immune boosting activities and recent research shows that it may have some application against cancer. Chaga is available in supplementary forms including powders, teas, and tinctures. If you would like to learn more about what chaga can do for you and how to use it, read on. Chaga or to give it its scientific name, Inonotus obliquus is a type of fungus which grows on the birch trees of Siberia and other cold regions like Alaska and Northern Canada. 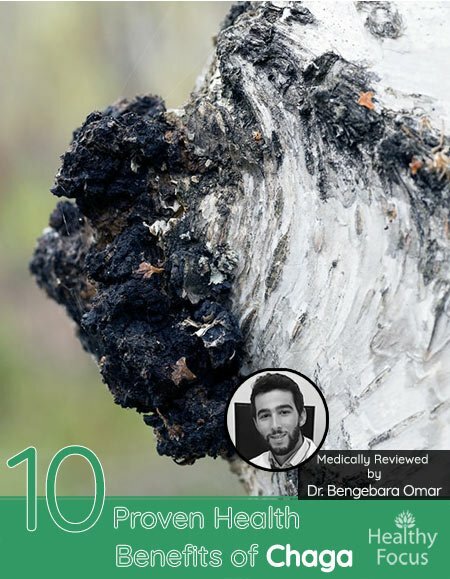 While it is often referred to as a mushroom, chaga does not resemble any mushroom that we are familiar with and botanists are undecided whether it should be classed as a mushroom at all. Unlike true mushrooms, chaga has a tough exterior resembling burnt charcoal with a rust colored interior. They can weigh over 30 pounds and grow in a variety of shapes up to 12 inches in diameter. Chaga’s relationship with the birch tree is symbiotic; they help the tree remain healthy and grow and can even help a sick tree to recover when inserted into the damaged tree. The chemicals and processes that help the birch tree are also of great value to human health and chaga has been used for centuries and possibly even thousands of years by various cultures familiar with its benefits. Indigenous Siberians ground it down and added it to their stews and soups to boost endurance and stave off degenerative diseases. It has been observed that Inuit Siberians had significantly greater life spans than Inuit from regions where they did not use chaga. Siberians consuming Chaga also appear to have lower rates of cancer. In Eastern Europe, chaga has traditionally been used as a treatment for skin conditions like eczema and respiratory disorders like bronchitis. Traditional Chinese and Korean practitioners have also made use of chaga since ancient times, and it remains popular in Asian medicine to this day. The first mention of Chaga comes from 16th Century Russian texts. Chaga was traditionally used to treat gastric ulcers and gastritis. A tea was made from chaga to treat intestinal pain and stomach upsets. Chaga was and remains especially popular for hunters and forestry workers because it alleviates hunger and boosts energy. Infusions made from chaga have long been used to treat various skin conditions like eczema and psoriasis. The Khanty people of Siberia are among the first known to have used chaga medicinally. As well as brewing a tea from chaga, the Khanty also produced ‘soap water’ by burning the chaga in a fire and then adding it to hot water. This ‘soap water’ was used for its disinfectant ability. Regardless of if it is technically a mushroom or fungus, there are numerous Health Benefits of Chaga. Chaga contains very significant amounts of powerful antioxidants with far-reaching health applications. Crucial other chemical ingredients include beta-glucans, other polysaccharides, phytosterols and triterpenes like botulin and betulinic acid which give chaga a diverse range of therapeutic benefits. Ergosterol peroxide is a medically exciting component of Chaga. Ergosterol peroxide has shown anti-tumor, anti-inflammatory, antiviral and immunosuppressive capabilities in the lab. Chaga is considered to be an adaptogen; a substance which helps normalize and balance body functions. Research has demonstrated that chaga could both stimulate immune response while simultaneously reducing inflammation, unlike most medications which typically have one effect or the other. When it comes to potent antioxidant superfoods, chaga has few equals. Superoxide dismutase (SOD) is present in chaga in substantial quantities. 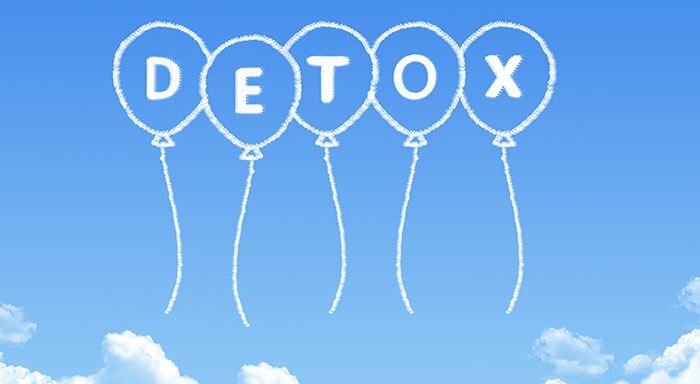 SOD efficiently neutralizes the damage done by free radicals, protects against disease and slows down the aging process. Studies have linked low levels of SOD with declining health and decreased lifespan. Diet is the best way to increase SOD levels and compared with other foods, chaga is an excellent source. In the ORAC scale a scale which was designed to measure the ability of food to deal with oxidative stress and absorb free radical damage, chaga has the highest rating. It has up to 50 times more SOD enzymes than fruit juices, leafy greens, truffles, and seaweed. Chaga’s incredible ability to combat oxidative stress makes it a powerful ally in the fight against aging, heart disease and cancer. An active and healthy immune system is essential to good overall health and protection against illness. Chaga is understood to be an adaptogen simultaneously working in two directions to helps boost and modulate the immune system. Many experts consider it to be one of the most potent natural foods for autoimmune diseases. A variety of the compounds contained in chaga such as betulinic acid and inotodiol work to reduce dangerous inflammation within the body. Inflammation can be extremely harmful and left unchecked might lead to severe conditions like heart disease, stroke, high blood pressure and rheumatoid arthritis. Because of its immune boosting and anti-inflammatory abilities, chaga has traditionally been used to support intestinal health and treat ulcers. As well as protecting the heart by its antioxidant and anti-inflammatory nature, the betulinic acid in chaga is known to help break down the bad LDL cholesterol in the body. Research conducted in Russia way back in the 1950s discovered that chaga had a beneficial effect on high blood pressure, but no studies have been undertaken since then. Be sure to consult your doctor if you have hypertension and are considering taking chaga supplements. Chaga extract has been approved as a treatment for various types of cancer in Russia since the 1950s. Another study has demonstrated that inotodiol; the triterpenoid compound found in chaga has potential as an anticancer agent. A 2015 study looked at another compound from Chaga mushroom and its anti-cancer potential. The study tested the anti-cancer activity of Ergosterol peroxide from Chaga mushroom on mice. Ergosterol peroxide was shown to inhibit colorectal cancer in mice. The extract inhibited cancer cell and tumor growth. Research suggests that Chaga may contain multiple anti-cancer components: Betulinic acid, Inotodiol, and Ergosterol peroxide. Chaga can be drunk as a healthy tea and is a great way to keep your digestive system in excellent shape. It helps relieve indigestion and other gastrointestinal pain while maintaining the digestive system working smoothly. Chaga stimulates digestive bile production which helps break down food especially stubborn fats and allows them to be absorbed more efficiently. Chaga is also an excellent source of dietary fiber. Chaga gets its distinctive dark color because of its very high melanin content. Melanin is a powerful antioxidant that is known to protect the genes and the DNA. Melanin is also the main pigment present in our skin and experts suggest that Chaga’s melanin content can enhance the health of your skin, keeping it beautiful and supple. It can help protect both the skin and hair from sun damage and might even help diminish the size of age spots. Want to know the best part? Chaga can be Quick and Easy to add to your Routine! There is some talk about Chaga being a cure for psoriasis. Some personal stories trying Chaga as a cure. If you read through the blog he claimed taking B12 as a combination of methylcobalamin and/or adenosylcobalamin helped and his Chaga preparation did not. Fox news reporting on Chaga. But most of the interest stems from a 1973 study done in Russia. 1 tablespoon of extract taken 3 times a day about ½ hour before meal. The treatment was noted as taking a while—with the maximum effect of treatment being after 9-12 weeks of continuous use. Following this protocol the researcher claimed 38 were cured, 8 showed improvement, and in 4 people it had no effect. The researcher noted likely alcohol abuse on those showing no effect. Bottom line—while I doubt it’s a miracle cure it might be worth a try over a few months. Everyone will react differently and its possible it may be helpful for some people but not others. There does appear to be a genetic modifier so it’s also likely personal genetics will affect what works for some people but not others. Because of its incredible antioxidant activity, chaga tea or supplements are an ideal addition to any detox diet plan. The betulin present in chaga is also known to have a liver detoxifying effect helping you clean out the system and start afresh. 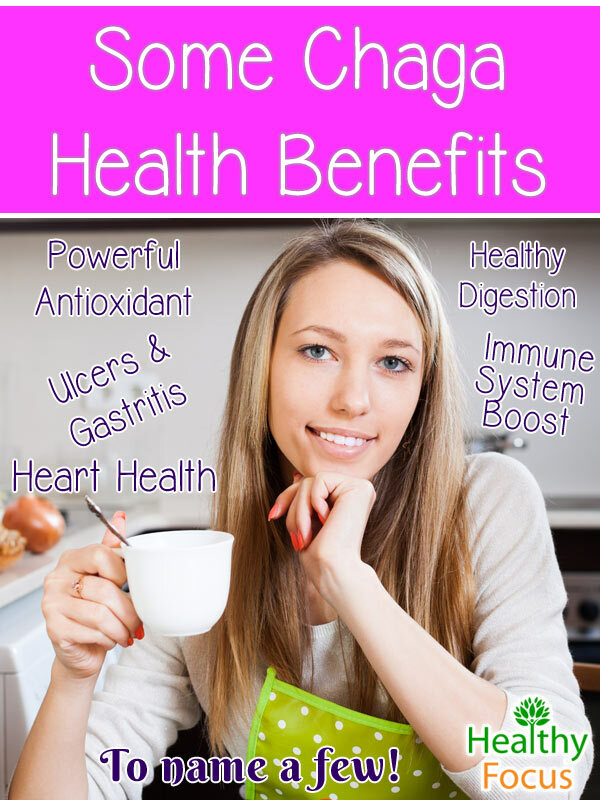 There is some research backing Chaga’s benefits for the liver. A recent study in 2015 tested the liver protective ability of Chaga Mushroom extract. On top of all the incredible abilities of chaga tea, it is also considered an adaptogen. Adaptogens help keep your body in balance, by making sure all systems aren’t going into overdrive. By maintaining a quiet balance in your body, you are better able to cope with stressful situations. Typically during stressful situations, the body’s first response is to release a wave of stress hormones, which contribute to feelings of fatigue and stress. Stress management is necessary to maintain your health, so at the end of a lousy day, kick back and relax with a soothing cup of Chaga tea. Chaga is not easy to find but can be consumed fresh from the tree Unfortunately it is unlikely that many of the readers live near to a forest full of wild chaga in which case it can be bought in a variety of forms including tinctures, capsules and purely dried pieces. One of the most popular ways to take chaga is in the form of tea which can be made quickly from dried chaga chunks by following a few simple steps. Break the chunks into manageable chunks of around 10 grams. Grind one of the chunks into a fine powder with a coffee grinder or something similar. Put between one and 2 teaspoons of powder into a teapot and add boiling water. Let the chaga steep for at least 5 minutes; the longer it steeps, the more medicinal ingredients you will be able to extract. Mushroom Coffees are becoming more popular as people are learning the healing benefits of many different mushrooms. Typically Mushroom and Chaga Coffee is a mixture of a small amount of coffee and an extract of the mushroom/fungus. Four Sigmatic makes an excellent Mushroom Coffee that contains both Chaga and Lion’s Mane and only a small amount of caffeine (40mg). At a little over a dollar a serving it’s a great and cost-effective alternative to Starbucks or Dunkin Donuts coffee. Personally, I go for the Four Sigmatic coffee in the morning and the Thrive 6 tea later in the day. Both include Chaga and other mushrooms like Reishi, Lions Mane, Cordyceps and Turkey Tail. What is Chaga Mostly Used For? Chaga is used for a variety of conditions including boosting the immune system, boosting energy, improving digestion and alleviating stress. It is also used to treat common skin conditions like psoriasis and eczema. READ Are Cashew Nuts Good For You? Studies done on chaga to date indicate that chaga is safe to use in the recommended doses. There have been no reports of adverse side effect but chaga may interact with certain medications like diabetic medication and anticoagulants. Who Should Avoid Using Chaga? Chaga is not recommended for pregnant women, breastfeeding mothers and children under the age of two. People with allergies too penicillin may also have a reaction to chaga. What does Chaga Taste Like? Chaga is slightly bitter but many describe its flavor as a pleasant and earthy. It is a bit of an acquired taste but many are happy to drink it with water alone. If you find the taste unpalatable then you can add honey or another natural sweetener to improve its taste. Currently, there is no strict dosage set for chaga, but some experts recommend one teaspoon of powder a day or about one gram. If you’re treating a specific condition, then you may take 2-3 grams a day until your condition clears up. There is currently no information regarding how much is too much, but its best to err on the side of caution and to follow the general rule of too much of anything is not good for you. Stick to one gram for general health maintenance and 2-3 grams for the treatment of an ailment. When taking a chaga mushroom tincture, drop some of the tinctures under the tongue and hold for 60 to 90 seconds and then swallow. Holding the drops under your tongue ensures that the chaga filters throughout your body as opposed to being immediately digested. Holding the drops underneath your tongue also makes the chaga act quickly, producing immediate results. To get the most detoxifying results from a chaga tincture, its recommended to take 1-3 drops once or twice a day. Its recommended that you follow these steps for 30-90 days to ensure that you are giving the adaptogens enough time to take effect. If you’re considering chaga tincture for stress management, try taking a couple of drops before knowingly engaging in a stressful situation. To prevent low blood sugar, take with meals. Now that you’ve got your hands on some chaga its essential to know how to properly store it. With proper storage, you can ensure that it maintains its integrity and healing powers. Chaga is a fungus, so once it has been harvested, it must either be refrigerated or dehydrated. If you fail to properly store your chaga, you may notice a powdery black substance growing on it. It is currently unknown how safe it is to take chaga once this powdery substance has started to grow on your chaga. Dehydrating your chaga is crucial because it not only keeps it fresh for consumption, it also helps it break down easier to make a tea. To dehydrate your chaga, break it down into two-inch pieces and place in a dehydrator. Set your dehydrator for 150 degrees and dehydrate the chaga for 8 hours. You can also spread your chunks of chaga out in an airy place for them to dry. Air circulation is essential when dehydrating chaga. While chaga has been used for centuries with no reported ill effect, there have been no clinical trials to examine its safety for children or pregnant women. If you are concerned about taking chaga, make sure that you consult a doctor first as it might, in theory, interact with certain medications like anticoagulants and also diabetes medications like insulin. A very powerful natural antioxidant with outstanding immune boosting properties. Studies show that chaga has anti-cancer potential. Provides a boost of energy. Has calming effects on the mind and helps relieve stress naturally. Readily available in convenient supplementary forms including tea, powder, and tincture. May keep you awake if you take it too close to bedtime. Very bitter flavor may put some people off using it. Potential interactions with certain medications.